Good morning! For those of you who went shopping on Black Friday, I hope you got some great deals! I used to be a BF shopper, but not anymore! My card for today uses another fun sketch from Mercy! This one is MTSC49, which I flipped to accommodate my tall tree. I'm also playing along with C4C13, which is to to use any type(s) of punches. I used my Martha Stewart snowman scene border punch. 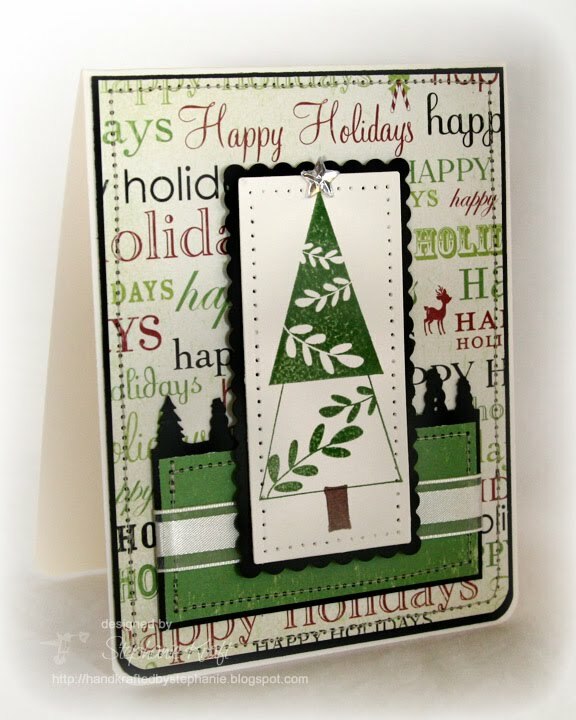 Accessories: Long Rectangle and Scalloped Long Rectangle Nestabilities (Spellbinders), Snowman scene border punch, star rhinestone (Martha Stewart), Corner Rounder (Marvy), Ribbon, Paper piercer, Foam tape, Thread, Sewing machine. Such a pretty card! I love all the green. This is a really beautiful card. I love the colours you have chosen to use. stephanie...this is so pretty! love those papers, the border punch, and stitching, and those rounded corners! Such a nice Christmasy card. I love that tree image and the nice shadowed punched trees combined with nice dp.